Should a post like this be tagged as Religion and Spirituality or Fashion Choices? Perhaps a better title for this post could be a quote extracted from the article which will be discussed. The quote is “Unveiling the Muslim woman”. Appreciate my writings being accepted here at Medium. What I appreciate even more is each time an email arrives in my inbox, almost every time there is an article with a title that’s provocative, so I am motivated have to look a little closer. Here is an article that peaked my interest: I’m tired of hijab. Let me share this observation from my life. At age 8, my mom enrolled me in a Catholic elementary school. That was my first experience with anything Catholic. 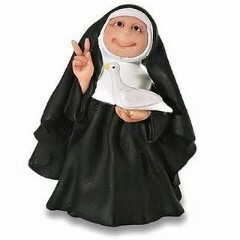 Most of my teachers were nuns and you couldn’t help but notice that they were fully covered — from head to toe — starting with the veil on their head. They never had to explain their dress. Anybody who saw them knew they were Catholic nuns. I can actually remember when the clothing was changed and they were allowed to wear shorter skirts, hemline just below the knee; and they were allowed to show a little bit of their hair. They still wore a veil but it was just pushed back so you could see some of their hair. Then there came a time when they just wore clothes like ordinary everyday people and there was a pin or a broach or some sort of symbolic accessory, in addition to the wedding band (“brides of Christ”), that they wore to indicate that they were still “women of the cloth”. They never had to defend themselves for what they were wearing and it was accepted that they were Catholics. Although the woman’s frustration is understandable, in my humble opinion, she seems to have skipped over the fact that — it’s not all about the hijab. It’s about associating a specific garment with a religious group that these days has become linked to terrorism. Whether or not anybody understands WHY she wears the veil — surely she must know what the hijab is connected to in the minds of many people. Should she stop wearing it? That’s her choice. But she can’t ignore what comes with making that choice. By the way, again … it’s my opinion … it seemed that the Muslim men who complained, were not complaining about her wearing the hijab. They were upset with her speaking her mind AND wearing a hijab while she did it! That’s a separate discussion entirely. Burka Wearing Mommies Stay Home!